Comm Eye Health Vol. 31 No. 103 2018 pp 68-69. Published online 09 November 2018. Consultant Ophthalmic Surgeon & Honorary Senior Lecturer: Ophthalmology Department, The Norfolk and Norwich University Hospital NHS Trust, Norwich, UK. Endophthalmitis can have devastating consequences for a patient’s eye and vision. Prompt recognition and urgent treatment are vital. 2. Perform B-scan ultrasonography (if available) to check for vitritis or retinal detachment. 3. Do not try to treat with a course of corticosteroids first – this will delay treatment and may result in losing the eye. After injecting intravitreal antibiotics, use a different syringe and a 30-gauge needle to inject preservative-free dexamethasone (400 μg in 0.1 m l) into the vitreous. Use the response to treatment and the results of Gram stain and culture to determine whether further intravitreal antibiotic therapy is required. Insert a 23-gauge or 25-gauge needle 4 mm (phakic eyes) or 3.5 mm (pseudoaphakic/aphakic eyes) behind the limbus into the middle of the vitreous cavity, pointing at the optic disc (approx 7–8 mm deep) and aim to aspirate 0.3–0.5 ml of vitreous fluid. Note: Use a new syringe and a new 30-gauge needle for each drug. Do not mix drugs together in the same syringe. An endophthalmitis kit should be accessible in every practice where postoperative patients are seen. This is essential for the prompt diagnosis and treatment of endophthalmitis. Include instructions for preparing the antibiotics (see p. 69). ESCRS Endophthalmitis Study Group. Prophylaxis of postoperative endophthalmitis following cataract surgery: results of the ESCRS muticenter study and identification of risk factors. 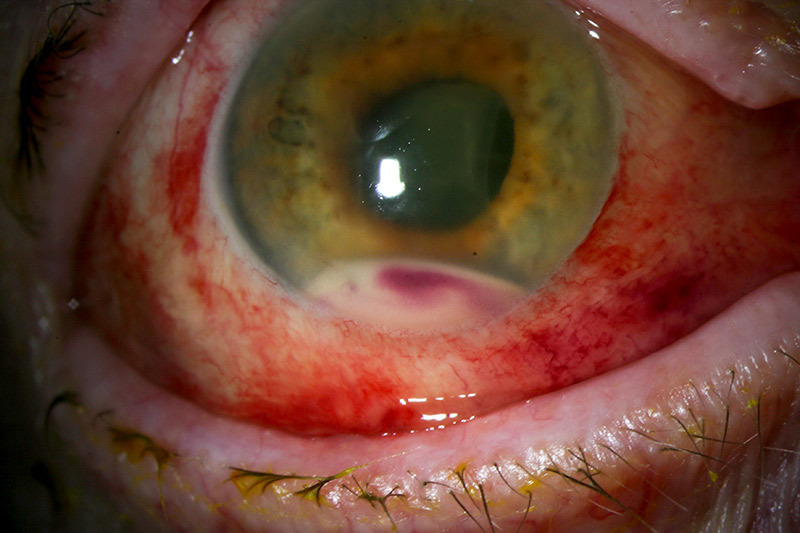 J Cataract Refract Surg 2007;33:978–988. Endophthalmitis Vitrectomy Study Group. Results of the Endophthalmitis Vitrectomy Study. A randomized trial of immediate vitrectomy and of intravenous antibiotics for the treatment of postoperative bacterial endophthalmitis. Arch Ophthalmol 1995;113:1479– 1496.